May is the month of our catalog transition at Stampin'UP! The old catalog expires at the end of this month. The new catalog will have lots of exciting new stamps and papers and ribbons and new punches and dies. But of course that means some current product will be retiring. This card was made by Karen Clark who is part of my local demonstrator stamping group. 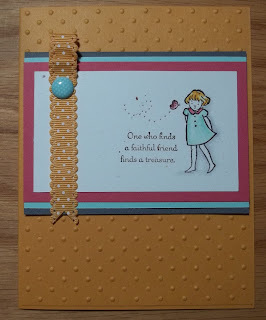 This card uses the retiring stamp set: Lean on Me. I love how Karen used a theme of dots on this project. The dotted trail of the butterfly with pierced holes. 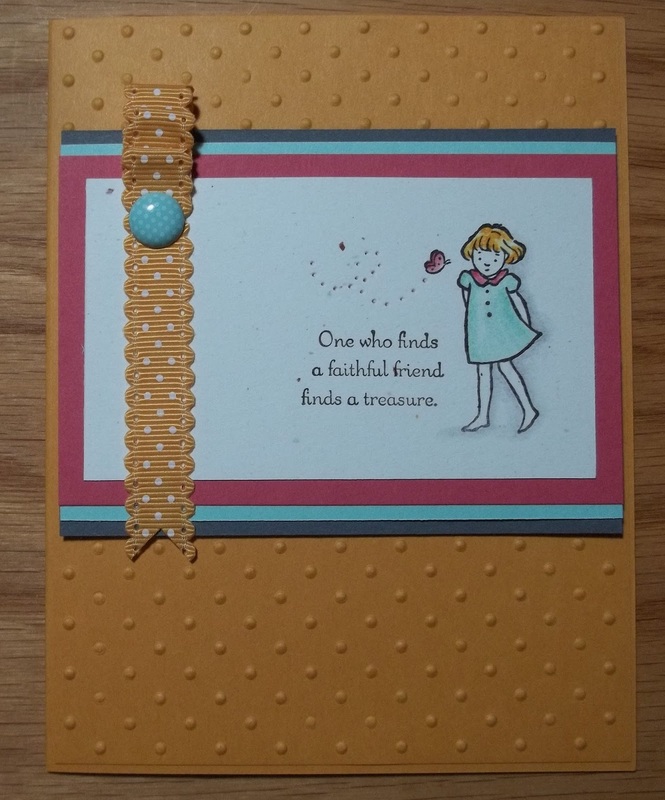 The Dots on the Ribbon (which by the way is retiring) and the dots from the embossing folder. I also like how Karen attached the ribbon. The folds on top are held in place with Red Sticky Strip (not retiring) and a brad (which is retiring). Be sure to check the lists of retiring product. Stamps will be available through the end of May but accessories are only available while supplies last - and some are already sold out. If you see something on the list that you want - DON'T WAIT. Some accessories are already sold out.